In stores, a rare heart locket sold in Mt. Shiveer's hot cocoa hut. Yep... 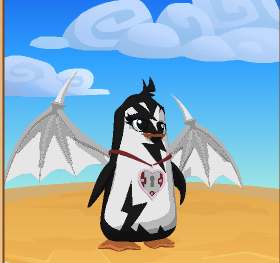 I think Prancing Coolpenguin likes her new look. Well, that's all for today! Please no swearing, cursing, or anything like that. Welcome to the Daily Gem Bonus! People who like this blog! Click Here to go and see the recent rare monday. Giraffes, Clearance, Items, Winners, & More! New items and a cool story! Blog is owned by WhatsThat. Picture Window theme. Theme images by merrymoonmary. Powered by Blogger.